Josh Elliott on the Tyco BMW. Defending champion Josh Elliott finished fourth in Sunday’s fourth round of the Pirelli National Superstock 1000 Championship at Donington Park, where Buildbase BMW’s Taylor Mackenzie increased his title lead with another convincing victory. The race was incorporated into the World Superbike meeting at the Leicestershire circuit, where Mackenzie took the win by more than two seconds from Hudson Kennaugh on the Trikmoto BMW, with Richard Cooper – also BMW mounted – filling the final place on the podium in third, half-a-second behind Kennaugh. Elliott from Ballinamallard slotted into fourth place on the Tyco BMW, three seconds back on championship favourite Mackenzie, with Clogher rider Keith Farmer taking fifth on the Quay Garage Racing Honda. Michael Rutter, who had been battling for the top six on the Bathams SMT BMW, crashed out at Melbourne but escaped unscathed. The veteran racer will now travel to the Isle of Man, where Rutter will be in action during practice on Monday evening. Fellow British championship contender Ian Hutchinson skipped the Donington Park round to focus on the TT and was quickly up to speed during the first practice session on Saturday evening, when the Bingley Bullet clocked the second fastest Supersport time on Keith Flint’s Came BPT Yamaha R6 behind Dean Harrison. Meanwhile, Lisburn’s Carl Phillips maintained his excellent run of form in the Pirelli National Superstock 600 class as the Sandown Racing rider clinched a fine runner-up finish. Phillips, who earned his maiden British championship victory in the previous round at the Brands Hatch Indy Circuit last weekend, had led in the early laps but was unable to prevent Tom Ward from opening a gap, who went on to wrap up the win on his Yamaha by 2.6 seconds. Phillips remains top of the championship table on his 600cc Kawasaki and now has a break of more than three weeks until the next round of the series at Knockhill in Scotland, which takes place from June 25-26. 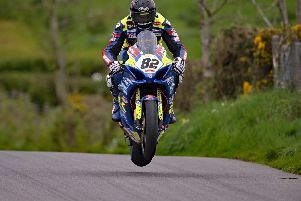 Kevin Keyes finished 11th on the Team Appleyard Macadam Racing Yamaha.